More than 15 years of United Nations negotiations on international climate agreements to reduce greenhouse gas emissions have so far been a resounding failure. Not only is there a higher concentration of carbon dioxide pollution in the earth’s atmosphere today than ever before, but moreover, mining and hydrocarbon activities, the main causes of global warming, have expanded drastically. Conditioned by the logic of the market, climate policies address pollution and the “right to pollute” as yet another commodity, placing at the service of the market the human and collective rights that are trampled by the pollution itself and by the polluters. It is within the framework of carbon “offsets” that negotiations began in 2005 around a mechanism for Reducing Emissions from Deforestation and Forest Degradation (REDD) and forest conservation, sustainable forest management and the enhancement of carbon stocks (REDD-Plus o REDD+). The Peruvian government has been one of the leading promoters of this mechanism since 2008. The objective of REDD+ is to adapt forests to market logic, creating a financial value for the carbon dioxide stored in their trees and soils, or rather, the capacity of forests to absorb this carbon. Countless REDD pilot projects, national and sub-national programmes and bilateral and multilateral agreements have emerged, with a number of international processes defining their implementation, including the United Nations Framework Convention on Climate Change (UNFCCC), whose parties will meet in Peru for negotiations in 2014, the World Bank’s Forest Carbon Partnership Facility (FCPF), the World Bank’s Forest Investment Programme (FIP), the voluntary carbon markets, the REDD+ Partnership, and the UN-REDD Programme. Peru participates in all of these processes at different levels. Peru has the ninth largest forested area in the world and the second largest in South America. Its forests and their peoples, rich in biological and cultural diversity, are nonetheless in a state of constant threat. The country’s macroeconomic “growth” has come hand in hand with various activities that are destructive to the Amazon rainforest and the people who live there. Despite the fact that 84% of the Amazon region is under concession for oil and gas industry activity, it is small farmers who are being singled out as the main drivers of deforestation. 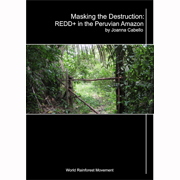 This situation has placed the Peruvian Amazon in the sights of numerous multilateral and private finance mechanisms, NGOs, brokers and consultants who are seeking to expand their business and profits with the help of the REDD+ mechanism.